Heavy rains over the past eight days triggered flooding, landslides and home and bridge collapses in Kerala. 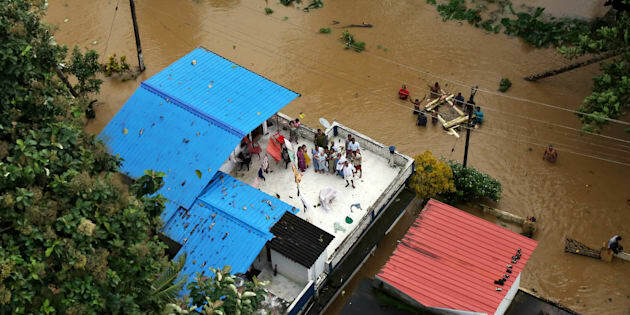 People wait for aid on the roof of their house at a flooded area in the southern state of Kerala, India, Aug. 17, 2018. NEW DELHI — Rescuers used helicopters and boats on Friday to evacuate thousands of people stranded on their rooftops following unprecedented flooding in the southern Indian state of Kerala that killed more than 320 people in the past nine days, officials said. With heavy rains stopping after a week, rescuers moved quickly to take those marooned by floods to 1,500 state-run camps. They used more than a dozen helicopters and about 400 boats across the state, relief officials said. The state's top elected official, Pinarayi Vijayan, told reporters that at least 324 people had died and more than 220,000 had taken refuge in the camps. Heavy rains over the past eight days triggered flooding, landslides and home and bridge collapses, severely disrupting air and train services in Kerala state, a popular tourist destination with scenic landscapes, waterfalls and beautiful beaches. The New Delhi Television news channel reported that the state was facing a new crisis with some hospitals facing shortages of oxygen and gas stations running short of fuel. The monsoon flooding has severely hit 12 of Kerala's 14 districts, with thousands of homes damaged since June. Crops on 32,500 hectares (80,300 acres) of land have also been damaged, the Home Ministry said. The international airport at Kochi, a major port city, suspended flight operations until Saturday after the runway was flooded. Authorities also asked tourists to stay away from the popular hill station of Munnar in Idukki district because of flooding. More than 1,000 people have lost their lives in seven states since the start of the monsoon season in June. A total of 407 people have died in Kerala, 190 in Uttar Pradesh, 183 people in West Bengal, 139 in Maharashtra, 52 in Gujarat, 45 in Assam and 11 in Nagaland state, officials and the Press Trust of India news agency reported.